Visitors to the Amankora Gangtey Lodge can set out on a hiking excursion to the Phobjikha Valley. The Himalayan kingdom of Bhutan, which touts itself as the happiest country on earth, is a pastoral fantasyland steeped in tradition. On the face of it, this was a dream trip. The coups de théâtre had begun with the heart-stopping flight into Bhutan's international airport in Paro, with the plane tilting its wings 45 degrees to squeeze between snowcapped peaks. At 7,300 feet above sea level, the airport itself was promisingly exotic, with a terminal that resembled a temple and a billboard-size portrait of Bhutan's young king and queen flashing smiles like Bollywood stars. Within an hour, I was walking a rope bridge across a river gorge to a fortress, accompanied by farmers in handwoven traditional garb. What's more, in the midst of this deluge of culture, I would be spending my first night in the lap of Bhutanese luxury. My entire suite in the Amankora Thimphu Lodge — located above the tiny capital city, Thimphu, and one of the five high-end Aman lodges that opened across the country a little more than a decade ago — was crafted from polished wood, with a terrazzo bath placed in its center like a site-specific sculpture. As dusk fell, the staff produced hot toddies made with the local whiskey, Misty Peak, to be drunk around a fire blazing on an outdoor deck overlooking a pine forest. The reason for my cantankerous mood was simple. Bhutan, which opened to the outside world in 1974 and which has a near-mythic status as one of the world's purest and most remote countries, places extreme restrictions on foreigners' activities. Travelers must follow a preplanned itinerary and have a guide present at all times, per the government. Because every movement must be planned, the experience can feel like visiting the U.S.S.R. in the 1970s. By the end of the very first day, I was ready to step off the manicured path. I told the Aman employees that I was headed off on a solo stroll around Thimphu. But it turned out I couldn't leave. Such a jaunt was not on my "schedule," the staff kindly informed me. All the guides had gone home, and I was not permitted to explore the capital alone. In any case, they added, it would be all but impossible to find a taxi at this hour, and there was no public transport. 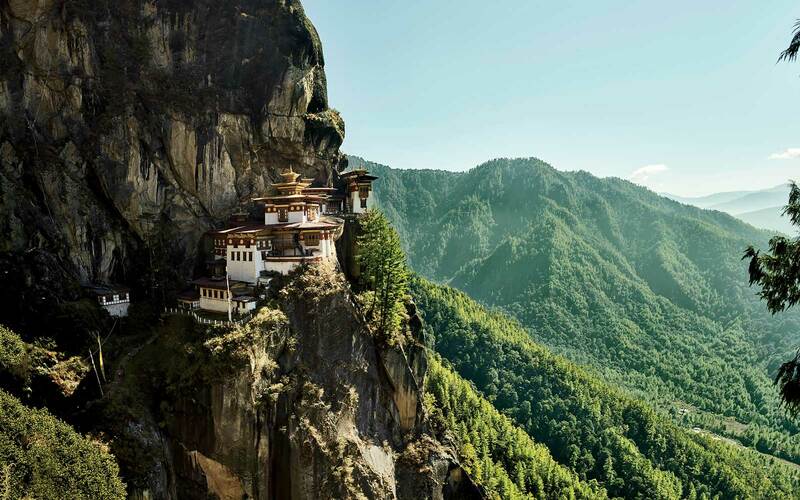 Bhutan’s most visited site, the Tiger’s Nest Temple, which visitors reach by hiking a two-hour trail. 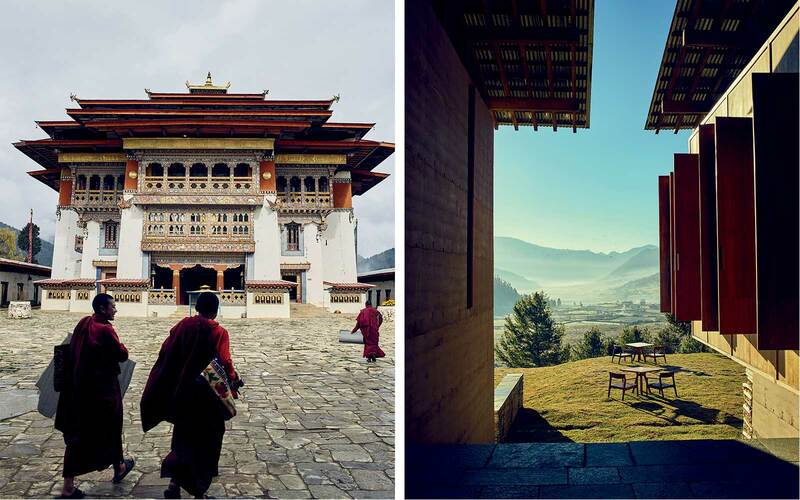 Adding to the mystique is Bhutan's unique approach to tourism. The country has always limited arrival numbers and in 1989 imposed a "minimum daily tariff" to keep out the riffraff (now $250 in high season, including a $65 sustainable-development fee, which goes toward providing the citizens with free health care and education). The restrictions were imposed to allow the country to step gingerly into the modern era and avoid the fate of other fragile cultures crushed by global onslaught. Still, Bhutan is hardly in stasis: Six Senses is opening five luxury lodges there this year, in the same key valleys as the Amans, and rumors swirl that other brands are looking to join them. Interest in Bhutan has grown in recent years, in part because the country still feels like a dreamlike time capsule, especially when compared with the many other corners of manic Asia that are plunging into the future. From left: The Gangtey Monastery, a center for the Nyingmapa school of Buddhism in Bhutan; a valley view from Amankora Gangtey. And I began to realize that the Bhutanese guides weren't so much passive as very shy, and unsure about what might actually interest a traveler. When Saturday night rolled around in Punakha, a pastoral valley with skies so bright and warm it resembled Napa with rice fields, as a joke I asked one guide, Ugyen, what the weekend party scene was like. Ugyen, who with his slicked black hair and aviators qualified as the hippest of the Aman employees, soon divulged that several nightspots were operating in a village called Sopsokha, half an hour away. It seemed wildly improbable. But after dinner, a few game guests piled into a car with Ugyen — now in mufti, having traded in his gho for a black hoodie and jeans — and roared off into the dark countryside. The spontaneous nightlife tour began in a roadside pool hall, where players had to dodge long strips of bloody beef hanging from the rafters in the early stages of being air-cured. Soon after, we were following pounding music down nearby stairs into a concrete bunker illuminated by colored lights. It was a historic moment: the Sopsokha region's first pop-up discotheque had opened that weekend. It was rumored that some village girls trying to make money to travel overseas were setting up the club for a month, and fresh-faced young farmers and yak herders had traveled from miles around to buy bottles of Misty Peak and the local firewater, ara, which many drank in traditional fashion, mixed with chunks of scrambled egg. The music was a medley of Western classic rock, Indian pop, and Bhutanese folk songs, all equally beloved by the wildly dancing crowd. As I lurched home at 3 a.m., I could feel that the script was beginning to fray. Of course, these cultural immersions paled in comparison to chasing the yeti skin. As I wandered the Gangtey Monastery with Max, trying to find someone who would let us in to see the artifact, I began to appreciate for the first time the depth of traditional lore in Bhutan. The religious complex, a bone-rattling five-hour drive from the capital, was an otherworldly enclave that seemed to float on its lonely hilltop, caught between lush forests and luminous clouds. Mist from the valley floor began to drift through the ancient courtyards, and every room was blackened by the soot from four centuries' worth of incense sticks and butter lamps. I couldn't believe it: the inner sanctum. Holding my breath, I pressed forward into a wood-paneled chamber illuminated by the watery light coming through one sliver of a window. As my eyes adjusted to the sepulchral darkness, I saw a wall lined with ghoulish animal trophies, like the monsters of a medieval bestiary — the desiccated carcass of an enormous fish baring piranha-like fangs; the hide of a feline that resembled a saber-toothed tiger; the scaly skin of a giant serpent. "This is the hand of a ghost," Max said matter-of-factly, pointing to a skeletal claw that had belonged to a "dead king" who once haunted the valley. I had been transported back to a prescientific age, looking at evidence of myth and legend. Max then shined the light of his iPhone to reveal a grisly skin nailed to the wall and hanging like a sinister cape — the red yeti. I cautiously ran my fingers over the 400-year-old prize. It was definitely animal hide, stiff and fraying, with mummified claws and feet attached. Framed by long strands of hair (which was very black by now) was a grimacing, simian face. It was hard to tell in the darkness, but the yeti's features may have been reworked by the monks over the centuries, perhaps with stretched leather, to stem the tide of decay. The attendants solemnly explained that this strange creature was known as a meichum, a smaller type of yeti, which had been spotted around the village in the 17th century. The creature had a thorn in its foot, and the peasants, once they got over their terror, helped to remove it. Later, when the yeti was found dead in the forest, the abbot ordered its skin preserved for the monastery's Cabinet of Curiosities. From left: Punakha Dzong, a 17th-century fortress; drinks by the fire at Amankora Gangtey; archers compete near the Punakha Dzong. On my last day, the contradictions of Bhutan came together at the Tiger's Nest Temple. This fantastical monastery, which seems almost glued to the side of a sheer cliff and can only be reached via a two-hour hike along a steep, twisting path, is the Machu Picchu of the Himalayas, its trails usually clogged with tourists. As it happens, I needn't have worried about the crowds. In December, even though it was sunny and 70 degrees, there were only a handful of hikers. For most of the time, my only company was a pious dentist from Sikkim, India, who took selfies along the route. I entered the Tiger's Nest solo, was waved into its labyrinth of lanes by a drowsy guard, and wandered through echoing chambers lined with age-old murals. Up in the last ornate shrine, a lonely monk was chanting to himself, and I joined him cross-legged on the stone floor. I had to admit that behaving like a pilgrim — going where everyone else was going, doing what everyone else was doing — wasn't so bad if you could find scenes like this. And while Bhutan's system has its frustrations, it's hard to imagine what the alternative would be. Tourism is thriving, and the government is debating deregulating portions of it in the eastern side of the country, where there are fewer travelers. (The idea is being considered by parliament, but mass tourism is violently opposed by every Bhutanese person I spoke to.) The country's single highway, until now an obstacle course of SUV-size potholes, will be paved this year. The more pessimistic observers say that in five years Bhutan will lose its innocence, making it the Cuba of the Himalayas with a see-it-while-you-can urgency. I realized that being able to visit under the current restrictions was a blessing in disguise. Independent travel is all but impossible in Bhutan. You must go through a government-licensed tour operator (they obtain your $40 visa) and pay the minimum daily tariff of $250 in high season (September–November and March–May) or $200 in other months. Most itineraries are about nine days, and can be booked through seasoned, high-end companies such as Remote Lands and Absolute Travel. Carole Cambata, a member of T+L's A-List, our network of editor-approved travel agents, also specializes in Bhutan. I stayed at Amankora (doubles from $1,550, all-inclusive), a series of five luxury lodges in valleys around the country. You don't have to stay at all five — but many visitors make the circuit to get the full experience. One of my favorites was Amankora Gangtey Lodge, an opulent eight-suite hotel on a hilltop in the remote Phobjikha Valley. It is within hiking distance of the vibrant Gangtey village and its ancient monastery, and each suite has its own wood-fired stove. Ask for a hot-stone bath to unwind at dusk. Another standout, Amankora Punakha Lodge, can be reached only by walking over a suspension bridge swaying above a roaring river. Hiking trails from its doorway lead across an orange orchard to small farms that seem lost in the Middle Ages, with prayer wheels placed at strategic points. With barely 100,000 inhabitants, Thimphu, the capital of Bhutan, will never be mistaken for a bustling South Asian metropolis, but it's still worth staying in the heart of the city so you can explore on foot. Le Méridien Thimphu (doubles from $380) has a traditional Bhutanese façade to fit in with the Himalayan aesthetic, but its rooms are surprisingly contemporary. By year's end, Six Senses plans to open its own circuit of five lodges. Your tour operator can work any of these sights into your itinerary. At the top of many a bucket list is the Tiger's Nest, a Buddhist monastery that sits on the side of a cliff. The structure was built beside a cave where the Guru Rimpoche lived after flying here on a tiger, as legend has it. The hike up was as memorable as promised: the steep two-mile trail, swathed in prayer flags, became more astonishing with every step. The National Museum of Bhutan was another highlight. Although still being restored after an earthquake in 2011, the circular 17th-century watchtower, or ta dzong, above Paro is an impressive attraction in itself. The exhibits on display offer a primer on Bhutanese culture, with information on holy men, relics in glass cases, and a natural-history gallery. Not everything worth seeing makes it into the scheduled tour circuit. In Thimphu, the Bhutan Postal Museum, which is dedicated to the humble stamp, perfectly sums up the country's quirkiness. Visitors can have their own images reproduced on legal stamps and use them on postcards to send back home — the ultimate Bhutanese souvenir.